Tag is the perfect activity for PE classes. It allows children to get plenty of exercise while participating in an activity they find enjoyable. 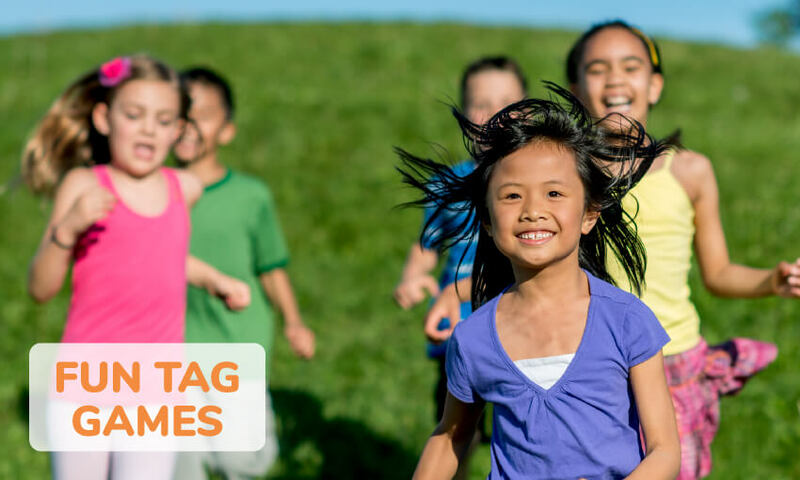 Most kids like tag because it is much more exciting than other forms of exercise like running laps or lengths of a sporting field. They can have a lot of laughs as they madly chase each other around. However, you can reach a point where traditional forms of tag become a little stale for kids. When this happens, turn to one of the 16 fun tag games for PE listed below. These action-packed variations will keep kids interested in your PE class and thoroughly enjoying themselves. How is tag traditionally played? Tag is played with two or more players. One of the players being selected to be “it”. The “it” player must chase and catch one of the other children to tag them, making that player the new “it”. Rules can be defined which make people safe from being tagged in certain circumstances. These rules usually include tag immunity while eating lunch, sitting in class and so on. Safe zones can also be defined, which protect players from being stealth tagged. 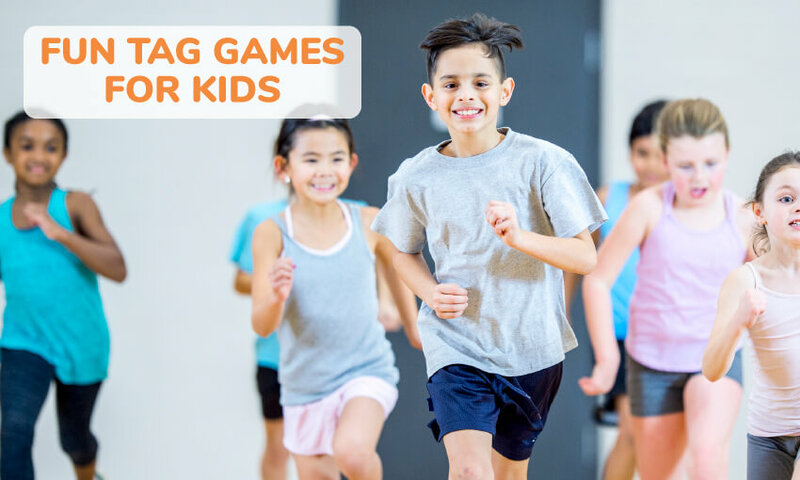 While most games of tag have a start and an end, games can continue between friends for weeks, with intricate rules that are designed to keep the game fun and fair. Here are some fun variations of tag that will work well for your next PE class. This popular version of tag is also commonly known as “jail tag” or “police and thief”. Participants will be split into two groups at the start of the game — “cops” and “robbers”. The cops must pursue the robbers and tag them in order to catch them. Once tagged, a robber must sit in a pre-defined location that is called the “jail”. Robbers can release fellow robbers who have been imprisoned in jail by tagging them, as long as they don’t get tagged themselves during the prison break. The game is over when the cops have managed to round up all of the robbers. Some versions of this game will allow the robbers to hide before the cops can look for them. This simple variation of tag is a lot of fun. The game starts with two people being nominated “it” instead of a single person. They will hold hands and run together in order to tag someone with their free hands. When they do eventually tag someone, that third person will join hands with them, like an amoeba multiplying! Because everyone is holding hands, the only people capable of tagging someone are the people on the end, as they are the only ones with a free hand. As more people are tagged, the group becomes larger and is capable of surrounding its victims. The round is over when there is no one left to tag. Zombie tag starts with a single player being nominated as a zombie, with the other players being uninfected humans. The zombie can convert humans to zombies by tagging them. As the game progresses, more and more humans are turned into zombies. The humans can defend themselves using soft throwable objects like socks, squishy toys, soft rubber balls, Nerf guns, and marshmallows. When struck by one of these soft objects, the zombie must freeze for 15 seconds. This gives the human time to get away. The game is over when all of the humans have been converted into zombies. This is a funny version of tag that is guaranteed to generate some laughs. The game starts like a normal game of tag, with a single player attempting to tag the other participants. However, if they manage to tag someone, the tagged player must squat as if they are going to the toilet while holding their hand out to the side like a handle. If another non-tagged player manages to touch their hand, they make a “whoosh” sound to symbolize the toilet flushing. They will then become non-tagged again and can re-join the game. The entertaining version of tag comes from Active For Life. This game requires a marked play area with two end zones. A basketball, volleyball, or netball court is about the right size, with the end zones being the out of bounds areas at the ends of the court. The game starts with one player being designated as the octopus. They will stand in the middle of the court and shout out “Come fishies come!”. The other players will then attempt to cross the playing area between the end zones without being tagged. If a person is tagged, they become “seaweed” and must stand still where they were tagged. The seaweed must also wave its arms around in an effort to tag other people. If a person is touched by a piece of seaweed, they are also tagged and become seaweed. This game is ideal for young children who may not have the athleticism required to play other versions of tag safely. At the start of the game, all of the players will sit in a circle facing inwards. One player is chosen to be the “fox”. They will walk around the outside of the circle, pointing at each player sequentially and calling them “duck”. They will eventually choose a player to be “goose”. Once a person is nominated to be the goose, they must stand and run around the circle in an effort to tag the fox before they steal their set. Because it will be difficult for the goose to beat the fox (who has a head start), all of children get a chance to be the fox at some point. At the start of this game, designate four areas as “animal cages” and choose a player to be the “zookeeper”. The zookeeper must round up all of the animals and put them into cages by tagging them. Another player will be designated the “monkey”, who is a mischievous character capable of unlocking cages and releasing the animals they contain. After choosing a zookeeper and a monkey, the other players are placed into four groups of animals. Each type of animal can only move a certain way. If you made one group kangaroos they would be limited to hopping. Horses could prance, cheetahs could sprint, bears could scramble on all fours. The animals are all loose at the start of the game and the zookeeper does their best to get them into their cages. Meanwhile the monkey keeps running around releasing everyone! Check out this variation of Animal Tag. This exciting game is a combination of hide-and-seek and tag. One player is designated to be the U.S. Marshall who must find the escaped criminals hiding in the local area. The criminals hide until they are spotted, at which time they can run from the Marshall. This game can also be played in teams, with a group of Marshalls attempting to find the escaped criminals. When played as a team activity, you can also set up a prison where criminals go after being caught. Untagged criminals can also cause a jailbreak if they sneak into the prison and untag their fellow criminals. This fun tag game is a variation of Manhunt and Cops-and-robbers. Start by splitting the players into two teams. One team runs off to hide and the other team counts to 30 and goes looking for them. Both teams have “jails”, where the people that they tag are sent. However, both teams can also release their friends from jail by tagging them. It can be quite chaotic as players attempt to raid the other team’s jail to release their friends while not being tagged. Learn more about Ringolevio. This version of tag is very common in India and Pakistan. The name translates to “up and down” because the game is played on an uneven surface. The lower surfaces are called Neech and the higher surfaces are called Oonch. At the start of the game, one player is chosen to be the “denner”. The other players will say “oonch neech ka papda, oonch maangi neech”. The denner then decides if they want players to seek out a higher (Oonch) or lower (Neech) area and yells their preference. If they chose Neech (lower), the other players must seek refuge somewhere high. This might be on playground equipment, in a tree, on a platform, on a staircase — anywhere above ground level. If a player is tagged, they become the new denner. This is a simple game that is a ton of fun. Frozen tag starts like a normal game of tag, with one player being “it”. However, when they manage to tag someone, that player is frozen. The frozen player must stand with their legs spread apart and a frozen expression. The only part of their body allowed to move is their eyes. Frozen players can come back into the game if another player crawls through their legs without being tagged. This leads to chaotic scenes where players are attempting to crawl on the ground without being tagged. #12 – What’s the time Mr Wolf? This game starts with one player being chosen to be Mr Wolf. Mr Wolf will stand at the opposite end of the playing field, facing away from the other players. The other players will all say “What’s the time, Mr Wolf?”. Mr Wolf can reply in one of two ways. He can tell them the time by replying with an hour ending with “o’clock”. If he does so, the players will take the same number of steps forward as the hour (5 steps for 5 o’clock). Mr Wolf’s other option is to reply with“Dinner Time!”. He will then turn and chase the other players back to the starting point. If Mr Wolf manages to tag anyone, that player will be Mr Wolf at the start of the next round. This popular version of tag is known by many names including “Red Rover”, “Cats and Mice”, and “Bullrush”. It starts with one player in the middle of a playing area. The other players must attempt to cross the playing area without being tagged. If they are tagged, they also being “it”, joining the other British Bulldog. This game includes some of the elements of frozen tag, but with a twist. Turtle tag starts with a single player being nominated as “it”. They can chase other players to tag them, but players also have the option of “turtling” by laying on their back while waving their arms and legs in the air (like a stranded turtle). While in turtle position, the player is immune to being tagged. Tagged players will be frozen and can be untagged by a non-It player (similar to frozen tag). This exciting tag game is a hybrid of soccer and tag. At the start of the game, two players are designated as “it”. These players will be given a soccer ball each. They can only tag someone by kicking the soccer ball at their feet. If the ball makes contact with the target’s feet, they will also be “it”. The winner is the last un-tagged player. Before playing this game, make sure the children know that the only acceptable kicks are ones aimed at the feet. There is also a fun hybrid of soccer ball tag and freeze tag explained in this video. This is a great option for the warmer months when it is too hot to run around outdoors. Underwater tag is played in a pool, so the kids can stay cool as they have fun. The game starts with the chosen “it” player (the “diver”) standing at one end of the pool. The non-tagged players are in the pool at the same end. They must spread out, so there is room for the diver to safely enter the pool. All of the untagged players have ribbons of different colors attached to their legs. The diver will begin to call out colors at random. When he calls a color that one or more of the swimmer have as a ribbon, that swimmer must attempt to swim to the other end. The diver must then jump into the water and attempt to catch them. Other swimmers can pretend to be the swimmer with the nominated color to deceive the diver, but they must return to the pool’s wall within 10 seconds. If many players are attempting to trick the diver, the diver will have to look underwater to find the person with the colored ribbon that they are looking for. This game works well with a large pool and supervision is required. 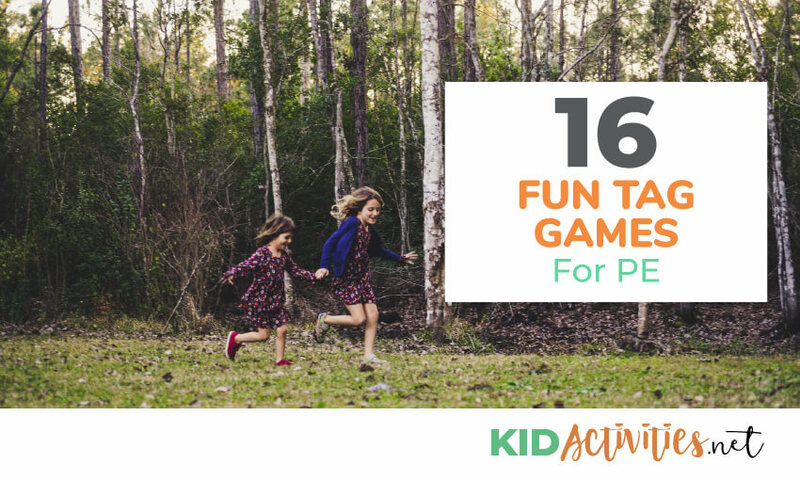 Thanks for reading 16 Fun Tag Games For PE. 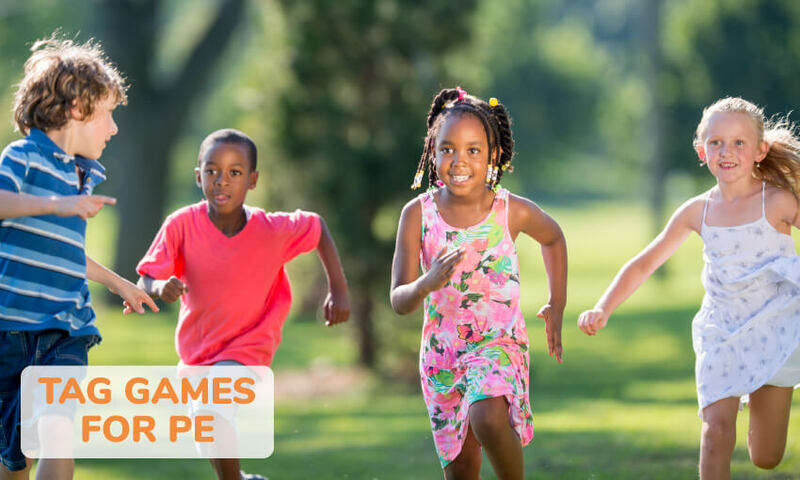 Bookmark our website for more fun PE activities for kids.